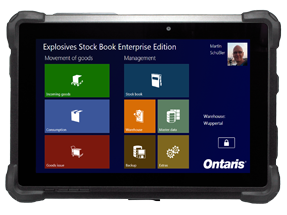 Currently you can choose from two scanners with the Ontaris Explosives Stock Book. One scanner (powerlineECCO+) is small, handy and very suitable when predominantly working with whole packages. The other scanner (Zebra DS3678 HD) is a high-performance scanner that is particularly suitable for companies that scan several individual articles or cartridges. The DS3678 HD was specially developed for use in rough environments. It is water- and dustproof (protection class IP67) and can survive falls from a height of 2,4 meters onto a concrete floor without any damages. A new look with a liquid lens enable the DS3678 HD to automatically focus at different distances. 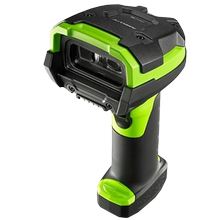 The result is that even the smallest barcodes can be read, scanned and evaluated with ease. The use of Bluetooth 4.0 (Low Energy) ensures lightning-fast connection setup and transmission with maximum energy efficiency. The DS3678 HD is equipped with an exchangeable battery that can be easily replaced during operation. The scanner comes with an additional battery and an external power supply unit. powerlineECCO+ combines compact and robust design with progressive modern technology. The scanner can read a 1D as well as a 2D barcode. The data is transmitted via Bluetooth to a connected tablet PC. powerlineECCO+ stands out due to its extreme ruggedness. Falls from 1.6 meters onto concrete or brief falls into the water are not a problem, thanks to the dual-wall ABS-plastic housing with protective rubber. Protection class IP64 allows for use in dusty and moist environments. Thanks to the integrated high-performance battery, the operating times achieved go far beyond the duration of a single shift.